Towards a fair performance pay policy. On the key issues, we are retaining pay progression processes that are as close to the STPC as possible. This is to provide maximum security for the teachers we have and because we think it is in our interests to project the school as a place where pay is fair. We’d rather not have PRP at all and we don’t believe in it – but recognise that, in order to retain alignment with STPC, we are legally obliged to adhere to the requirement for PRP. So, we’re keeping the M1-M6 scale and the standard UPS scale with no half or double points. We’re honouring the national pay rises as they come forward. We’re honouring pay portability from other schools, unless there are special reasons where, by mutual consent, a reduction is agreed. We recognise that lesson observations don’t tell the whole story about a teacher’s performance and we don’t use simplistic data targets. In our Professional Review process (equivalent to Performance Management) we want staff to set themselves ambitious professional development goals and not focus on safe achievable goals in order to secure pay progression. We’re determined that PRP does not dampen the ambitious spirit that permeates the school. Departmental Review: work in progress. The key phrase to trigger any non pay progression is ‘significant concerns‘. If any such concerns exist, then we think this warrants a special process that cuts into our Professional Review cycle whereby a Middle Leader works with an SLT member and the member of staff concerned to establish more specific targets around improvement. 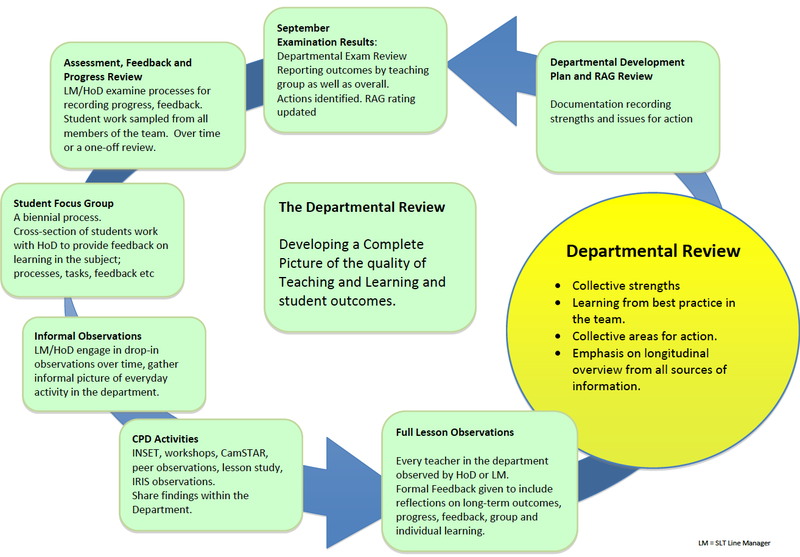 This reduces the pressure on middle leaders to have a consistent approach to evaluating staff and allows them to have robust developmental conversations without the spectre of pay progression getting in the way. SLT members will always be involved if ‘significant concerns’ emerge. If there are concerns of this nature, an Individual Action Plan will be written that includes the targets, the timeframe and the support that will be offered. These targets are not the same as the aspirational goals set during Professional Review. The IAP targets can be very tight. 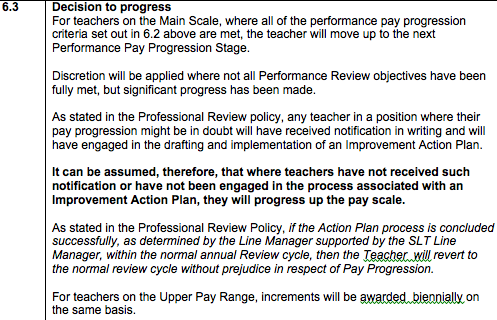 Only if these issues are not addressed, will the teacher then proceed to a situation where pay progression is denied. Meanwhile, the majority of staff will be secure knowing that, in the absence of this process, they can be certain of their pay progression. 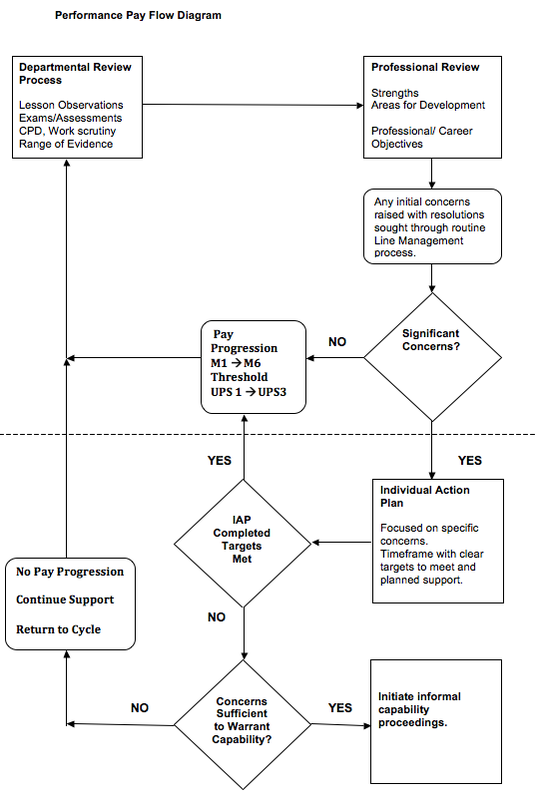 The pay policy flow diagram. This process allows the possibility of non-progression; it links into the capability system if necessary but, above all, for most people, it protects them from the insecurity associated with PRP because the Professional Review process takes account of the full range of their activities and does not allow single lessons or single data sets to have undue weight. Much of what you suggest is similar to the spirit of the NUT model policy. 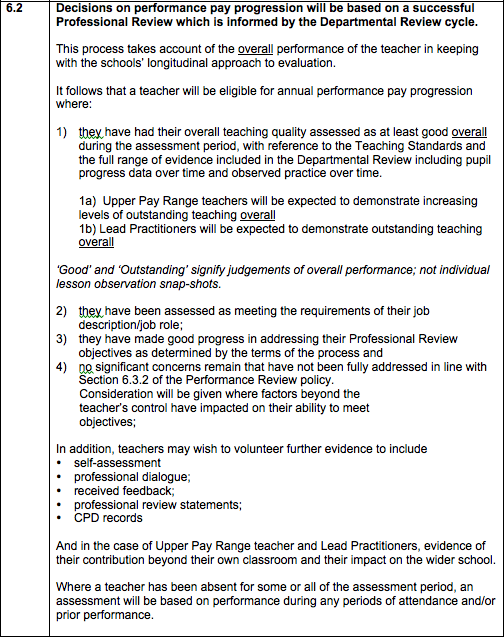 The key is fairness and transparency – not forcing teachers to voluntarily abandon STPCD in order to obtain a pay rise. The fear is that money will dominate and force schools to be harsh with younger teachers – keeping them on low pay indefinitely … and cruel to older teachers – pushing them out, via malevolent observation, just because they are expensive. Tom, in Haringey – all Headteachers are looking to keep things the same and keep the format similar for all schools within the borough. We are following ASCLs policy – via Woodside – which has been written by Joan. Tom this is an excellent and well thought out policy that clearly demonstrates a commitment to a CPD model of development and is fair. Thank you for sharing. I have always felt it is a difficult balancing act for those of us that take on increasing whole school responsibility in the mould of the old “senior teacher role” with a whole school responsibility, whilst still running and developing our departments and without an SLT brief. We can easily be distracted from operating our own classrooms at consistently outstanding levels, as we develop other aspects of both our own teams and move the school forward. Although before the extra demands we may have been operating at that level. Occasionally at least!! Your model allows outstanding to take a more holistic view of contribution of middle leadership.